You may be wondering why the Management Pocketblog would take a look at a woman whose principal contribution was in the field of social work, relationships, and family therapy. The answer is that others have found in her work valuable tools that can help you in your leadership and communication roles. Virginia Pagenkopf was born in 1916, in Wisconsin, and went to high school in Milwaukee. She graduated from the Milwaukee State Teachers college in 1932, with a degree in teaching and started started work as a teacher. There, she started visiting students in their homes, and meeting families. A few years later, she retrained as a social worker at University of Chicago and received her masters degree in 1948. Satir went into private practice, conducting her first family session in 1951. Towards the end of the decade she moved to California, and co-founded the Mental Research Institute (MRI) in Palo Alto, California, where she became the Training Director, and started the first formal family therapy training program. Satir’s innovation and eminence as a family therapist are well documented elsewhere. 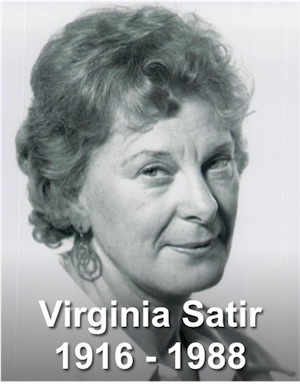 There is a thorough biography and much additional material on the Virginia Satir Global Network site. Satir died in September 1988. At the heart of Satir’s family therapy was powerful listening and questioning. It therefore came to the attention of the founders of Neuro-linguistic Programming (NLP), John Grinder and Richard Bandler. They studied Satir, documented her process, and co-wrote a book, Changing with Families, with her. The model they created by observing Satir’s questioning is one of the foundation stones of NLP. Whilst it comes in and out of fashion, popular books about NLP are widely used by managers and professionals looking to be more influential. Generalisations, in which we take an event or situation, and presuppose it is more widely applicable, or applies in a specific circumstance, for which there is no evidence. Deletions, in which we unwittingly ignore some of the facts, feelings, or evidence and therefore place too much reliance on one part of what we observe, so biasing our beliefs and behaviours. Distortions, in which we make assumptions that are not founded in the evidence. These are the most insidious of the filters, because they cause us to assign meanings or causes to actions and events, which are unhelpful and not accurate. A dominance posture that asserts power and authority. It can be aggressive, even offensive, and signals that the other person has done something wrong and is being called to account. It is characterised by a square-on posture, leaning in to the accused person and often supported by a pointy finger. This is almost the opposite – a submissive, maybe even pleading posture. It signals weakness, so only use it when you intend to be confrontational. The weaker your true position or status, the less you should use it. It is characterised by a direct appeal to the other person, with palms upwards. This behaviour suggests rational thought, and people therefore often use it to disguise emotion. Also use it to slow a discussion down, by signalling you are considering what you have heard. The vital postural clue is that one hand supports the chin, with the other supporting it, crossed over the body. The hand supporting the chin often has a finger pointed upwards to the temple. 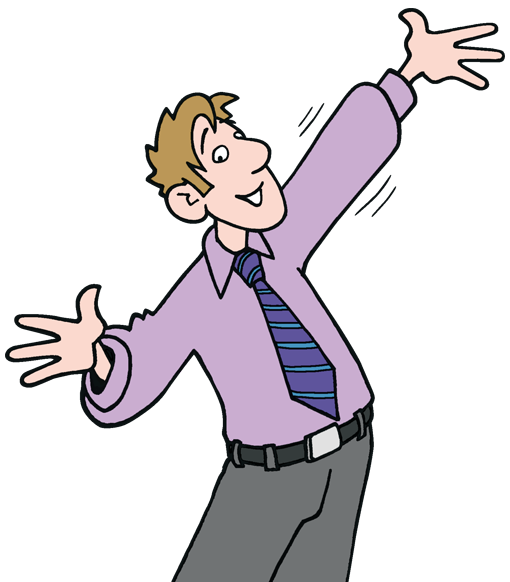 Use this posture to attract attention, and create a non-threatening, humorous mood. But be careful, because it can undermine a serious message, and also signal lack of candidness – even untruths. The key to this posture is asymmetry – often very marked. Use this posture to calmly assert control. Slow down, stand to your full height, and face your audience. This posture convey honesty, integrity and openness. Gently move your hands downwards, together, with your hands open, palms downwards. The Five Satir Categories – Virginia Satir. Click to enlarge. The last model is the one I find most useful. This stage is marked by established norms of behaviour. The situation may not perform as well as it should, but everyone feels comfortable. Encourage people to test their assumptions and seek ideas from outside the group. The perceived threat of change triggers resistance, as people feel their power and their control challenged. Help people to evaluate their feelings and overcome their instinct to deny, avoid or blame. Now that things are changing, the group is distracted from the day-to-day, and performance dips. Create a safe environment that enables people to acknowledge and explore their concerns. Avoid the temptation to rush this stage with instant solutions. Gradually the new ways of working bed in, and people start to feel back in control. The group will start to iron out problems, and find new norms of behaviour. Be supportive and focus on recognising and celebrating successes. All is well again (until next time) and people feel energized by their success. Help people feel safe in continuing to learn and improve their performance. I’ll start again: Amy Cuddy is best known for her remarkable 2012 TED talk, ‘Your body language shapes who you are’, which has become the second most watched TED talk, with over 26 million views to date. You can watch it and add to that number at the foot of this blog. And you should. Amy Cuddy was born in 1972 and grew up a small Pennsylvania town. As a result of a car accident during her undergraduate years, she suffered a serious head injury that doctors asserted would compromise her academic ability. Nonetheless, she graduated from the University of Colorado in Social Psychology (1998) and then went on to earn her MA and PhD (2005) in the same subject, at Princeton. Cuddy took a role as an Assistant Professor at the Kellogg School of Management at Northwestern University, teaching leadership to MBA students. She moved to become Assistant Professor of Psychology at Rutgers University, and then, in 2008, to Harvard Business School as Associate Professor, where she teaches MBA courses and executive education programmes, specialising in negotiation, body language, power and influence. 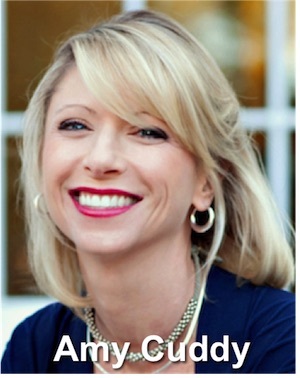 Amy Cuddy’s research interests have yielded nuggets of valuable knowledge for managers. 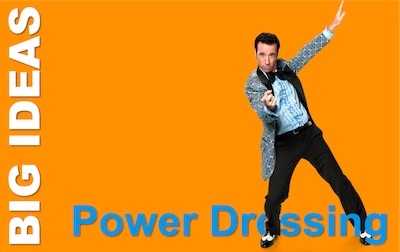 Her most famous and impactful for many is the concept of the Power Pose, developed with Dana Carny and Andy Yap. But I will leave her to describe that far better than I ever could, in her TED talk below. Instead, I will focus on her research (with Susan Fiske and Peter Glick) on how we judge one another. Cuddy’s research indicates that our judgements of people can determine how we will interact with them. This can affect our emotions, intentions and behaviours in hiring, promoting, electing, taking risks, giving to charity, and even persecution and genocide. 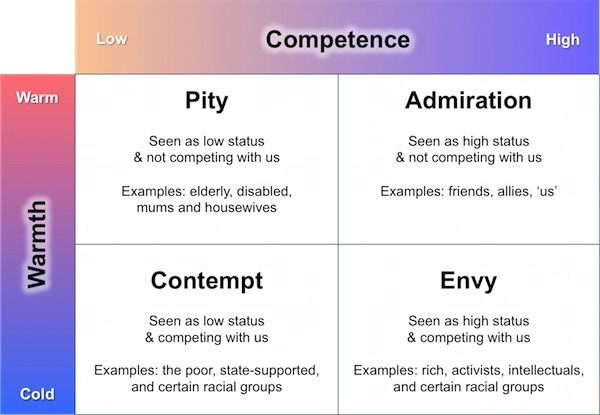 Two trait dimensions are particularly salient in our judgements: warmth-trustworthiness and competence-power. This leads to stereotyping of racial groups, leading onwards to discrimination and persecution. The first and most important judgement we make about someone we meet is their warmth: it is an attempt to assess ‘friend or foe?’ Then we try to assess their competence – ‘if they are a foe, how much care do I need to take?’. Another generalization we make is pervasive and dangerous: we generalize our experiences across a whole social or racial group: gender, ethnicity, age, or nationality. We also create another dangerous generalization: that warmth means not-competent and competent means not-warm. Too much of one trait leads us to suspect a shortage of the other. Hence the title of her much re-printed 2009 Harvard Business Review article, ‘Just Because I’m Nice, Don’t Assume I’m Dumb’. Regular readers will know that I am a sucker for models and they don’t get simpler than four boxes. Here is one that flows from this, developed by Cuddy, Fiske and Glick. 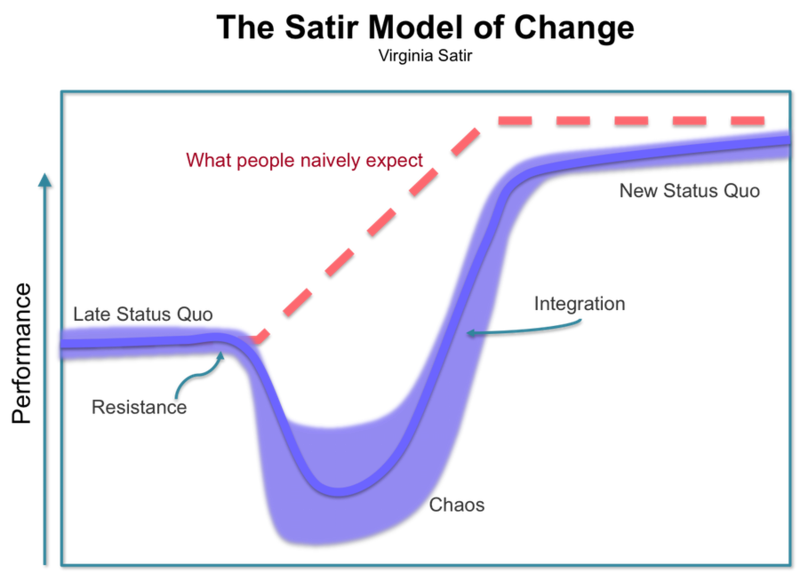 As soon as you look at this chart, you can see how the people and groups seen as cold are also the ones whom societies persecute – particularly when they are under pressure – either as ‘soft targets’ or as a ‘danger to society’. Amy Cuddy’s 26million+ TED talk that introduced the world to power posing. Mastering Difficult Conversations: What sort of monkey are you facing? Today we have a guest blog from author Pete English, who has just given a successful presentation at CIPD’s Annual Conference and Exhibition on the topic of ‘Mastering Difficult Conversations: What sort of monkey are you facing?’. Pete’s website is www.peterenglish.co.uk and he can be contacted at pete@peterenglish.co.uk He has written three Pocketbooks: Tackling Difficult Conversations, Confidence and Succeeding at Interviews. Many of our day-to-day behaviours have been hard-wired into us over thousands of years of evolution. Our ancestors survived by being excellent threat-detectors (it was important to decide quickly whether an animal or situation was safe) and by being good at sucking up to the leader of the pack, to put it bluntly – according to the evolutionary psychologists, being friendly with the alpha male or female enhanced your survival prospects. So, we’ve evolved to be vigilant and status conscious. Apparently when we meet someone, the first thing we unconsciously assess is their level of status – do I need to be wary of this person? Do I need to keep on the right side of them? And other primates are sniffing you, picking up cues as to how powerful you are, how much respect they need to give you. If you want to master this game, it helps to know what kind of monkey you are dealing with. Let’s consider the Chimpanzee and the Bonobo. In the wild, chimpanzees are very territorial, competitive and (particularly when threatened), ferociously aggressive. 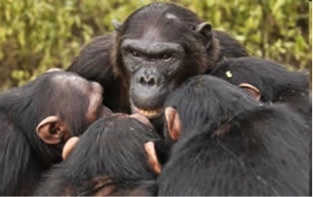 There is a strict hierarchy with a male chimp at the top. their focus is on the task in hand, with little or no attention paid to pleasantries. Bonobos are very different. They are much more relaxed about their territory. Rather than seeking to dominate, they engage in ‘affable social networking’. 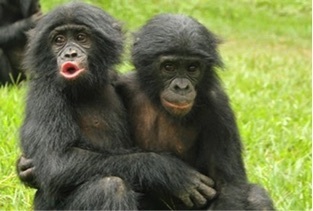 Bonobos are much less hierarchical than chimps, and tend to form matriarchal groups. you get the impression that their primary focus is ‘mutual stroking’, with the task being secondary. Next time: how to handle each type of monkey (and what they think of you). This is the first part of an extended correspondence course in management. You can dip into it as you go, or you can follow the course, right from the start. If you do that, you may want a course notebook, for the exercises and any notes you want to make. Self confidence is the starting place for any manager. Your promotion to managerial role has probably been triggered more by your expertise in doing your previous job, your reliability, and your character, than by any specific evidence of your managerial capability. And that’s fine, because it is the way most of your colleagues were promoted too. But it can leave you feeling a little nervous about your suitability to manage and, when your boss tells you to ‘get on with it – I have every trust in you’ you can feel a little isolated. Your boss leaves you to it, your new management peers don’t yet trust you, and your team are wary of how you will treat them, now you have become a manager. Here are three exercises to help boost your self-confidence. Imagine it is Monday morning and you are in work, ready to start the day. In a minute, close your eyes and picture yourself there. Picture your first few conversations and meetings going well. Notice yourself handling the situations effectively, feeling well-prepared. As you go through your morning, picture everything you do going as planned. At each stage, notice how good that makes you feel. At the end of your morning, imagine how positive and confident you will feel. Now, close your eyes and play that movie in your head for several minutes. When you have done this, make a note in your notebook about how you felt at the end of each part of your morning. Write down what you did to achieve your successes. This is an exercise to repeat several times over the coming days. Each time you do it, choose another day and either the morning or afternoon. Every time you do it, you will increase your base level of confidence. One of the reasons some people feel more confident than others is simply levels of hormones in their bodies. For example, increased testosterone levels increase confidence, whilst increased cortisol levels decrease confidence. Perhaps it is surprising, but your gross posture affects levels of both of these hormones and, whether you are a man or a woman, you can increase testosterone levels and decrease cortisol, by adopting power poses. You can do these poses for two or three minutes before going into a stressful situation and you can maintain confidence-boosting hormone levels by maintaining upright, open postures during your day. Stand upright, legs apart – slightly wider than shoulder width – and put your hands on your hips. If there is a table, counter or a solid back of a stable chair available, place your hands firmly on it, about 70-80cm apart (wider than your shoulders) and lean forward. Adopt these poses for two minutes or so. If you have a chair to sit on, try sitting upright, legs apart, with feeet firmly on the floor. Plant your hands firmly on your upper thighs, with elbows outwards. Lean your body back a little, with head a little forward. Or try putting your feet up on a table, leaning back in your chair, with your hands clasped behing your head, elbows splayed out. Adopt one of these for two minutes. If these poses remind you of a typical ‘old-school alpha-male boss’, they should. The difference is that you will adopt these poses privately for a few minutes at most, to boost your confidence for the next meeting; rather than maintain it in the meeting to intimidate your colleagues. For all-of-the-time posture, keep to standing with feet at hip or maybe shoulder width, head upright, as if pulled by a puppet string, and arms by your sides. This open body, coupled with upright posture, will not only make you feel more assertive, but will enhance your breathing, your vocal tone and projection and present your image as confident and authoritative. Like so many people, i have long found the topic of ‘body language’ irresistible. It feels as if there should be some deep secret – known only to adepts – and some magical understanding of our fellow human beings to be gleaned from its study. Of course, neither is true. Anyone can understand the signals that our bodies leak into the social environment and any understanding you gain is far from magical – it will remain flawed.